One of the most controversial and hotly debated topics among Zelda theorists is the ending of Ocarina of Time and the effects it has on the rest of the series. The controversy stems from the fact that the game actually has two endings. In the first, or “adult” ending, Link defeats Ganon, and the Seven Sages are able to seal him away inside of the corrupted Sacred Realm. Zelda, filled with remorse for the trouble she caused, and wishing Link to be able to live out his childhood, returns Link to being a child again. 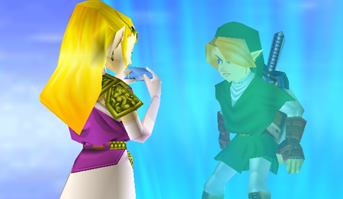 The second, or “child” ending, takes place as a result of Zelda sending Link back. Link, as a child, enters the castle courtyard and approaches Zelda. The two endings to Ocarina of Time gave birth to the concept of the “Split Timeline”; the idea that there are two separate chronologies of the Zelda games, each stemming from one of Ocarina of Time’s endings. This idea was not readily accepted by many Zelda fans and theorists at the time, but with further evidence in recent games, and quotes from the directors of the series, the Split Timeline has been firmly cemented. Over the next few years more evidence of a split timeline emerged with the release of the next two console Zelda games: Majora’s Mask and Wind Waker. Majora’s Mask was clearly a direct sequel to the child ending featuring the same Link. Wind Waker on the other hand, referenced the events of the adult ending in its backstory. Many theorists did not consider this enough to confirm a split, and argued that Wind Waker could work just fine on the same chronology as Majora’s Mask. Since the intro to Majora’s Mask stated that the Royal Family passed down the story of the Hero of Time, many believed Wind Waker’s intro to be a continuation of the passing of the legend, and therefore, not necessarily taking place after the events themselves. The game itself possesses evidence for both sides. The inhabitants of Tingle Island in Wind Waker discuss the events of Majora’s Mask, which would suggest that the two games take place on the same timeline. However, Hylian text [which is actually an altered form of Japanese] from the game’s intro has been translated, and implies otherwise. While the intro in English merely states that the Hero did not return because he left on another journey, a possible allusion to the events of Majora’s Mask, the Hylian text states that he journeyed into the flows of time. This version of the tale seems to refer to Zelda sending Link back in time, an event which happened in the adult ending. Aonuma: You can think of this game as taking place over a hundred years after Ocarina of Time. You can tell this from the opening story, and there are references to things from Ocarina located throughout the game as well. Miyamoto: Well, wait, which point does the hundred years start from? Aonuma: Oh, right, let me elaborate on that. Ocarina of Time basically has two endings of sorts; one has Link as a child and the other has him as an adult. This game, The Wind Waker, takes place a hundred years after the adult Link defeats Ganon at the end of Ocarina. If you think back to the end of The Ocarina of Time, there were two endings to that game in different time periods. First Link defeated Ganon as an adult, and then he actually went back to being a child. You could say that The Wind Waker takes place 100 years after the ending in which Link was an adult. Because there was still little, and conflicting, in-game evidence, these two director quotes went largely ignored. It wasn’t until 2006, with the release of Twilight Princess, that split became almost universally accepted. When asked about the placement of Twilight Princess, Aounma gave a detailed answer that would later be dubbed “The Split Confirmation Quote”. Interviewer: When does Twilight Princess take place? Interviewer: And the Wind Waker? years in time, he beat Ganon and went back to being a kid, remember? several years after Ocarina of Time. Though the split is firmly established now, one question remains: At what point did the split occur? To answer this, and explore the ramifications thereof, we must determine at what point in time Link was sent to in the ending of Ocarina of Time. Ben Lamoreux [alias Erimgard] and Alex Plant [alias Seran Aileron] will be discussing and debating that very question. In the following debate, Ben will be defending the stance that Link returned to a point in time before he pulled the Master Sword, and Alex will be defending the stance that Link returned to the point in time just after he had pulled the Master Sword. Question: What happens to the Master Sword in the adult ending? Ben: Zelda states that the Master Sword must be returned to its pedestal, but we don’t actually see this physically happening. Instead, she sends Link back to his own time almost immediately after saying that. Either the Master Sword returned to its pedestal on its own, or Zelda put it back in Link’s absence. I’d say the latter is more likely. Alex: Honestly, I can’t say. This seems to be a plothole at the present time, as Link is instructed to leave the Ocarina of Time behind but still holds the Master Sword when he is sent back in time. Previously I theorized that he was sent back to “lay the Master Sword to rest and close the Door of Time” in that order, and that “laying the Master Sword to rest” is what actually sent him back in time, but the Japanese script of Ocarina of Time seems to suggest that Zelda sent him back in time directly from that scene. Question: Why does Link have the glowing Triforce crest in the ending scene? Ben: Link has a Triforce crest because he possesses the Triforce of Courage. It’s likely glowing, because he’s willing it to do so, in order to validate the tales of his adventure. Alex: Ganondorf has managed to enter the Sacred Realm and touch the Triforce, so it has split and he along with Link and Zelda possess Triforce crests. Question: Why does it not appear in the Temple of Time scene? Ben: As Link is not near another crest-bearer, and since he’s not specifically harnessing its power, there’s no reason for it to be resonating. Alex: The Triforce had not yet been touched by Ganondorf. Question: Why/how does Zelda not also have a Triforce crest? Ben: Zelda does not have a glowing Triforce crest because she is either not close enough to Link for her piece to react to his, or her piece had just not yet begun to resonate. The focal point of that scene is Link’s piece, as it validate’s his story, and showing Zelda’s piece wouldn’t have added much to the scene. Alex: We do not get a clear enough picture on Zelda’s hand for the crest to be readily visible, although it is true that it is not remotely apparent anyway. In terms of an actual story-related answer, I agree with Ben’s thoughts on this. It would seem the scene specifically shows Link’s crest to tell us why he has come to see Zelda. Showing Zelda’s crest would be superfluous, thus it was not programmed. Question: Why does Link have the conversation with Zelda in the Child timeline, and what do you believe are the results of this? Ben: Having experience the results of pulling the Master Sword, and having returned to a time period prior to doing so, Link’s conversation with Zelda was to warn her about the consequences. The result of this conversation is that Link never pulled the Master Sword, and Ganondorf was denied access to the Triforce, and was no longer trusted by the King. As Eiji Aonuma stated, their conversation changed their relationship with Ganondorf. Instead of inadvertantly giving him the very thing he wanted, they denied him it. Alex: The conversation with Zelda happens sometime after Ganondorf finally is able to touch the Triforce. Link gains the Triforce crest and, knowing what that twist of fate must mean, decides to inform her of what has transpired. Since Ganondorf has the Triforce of Power he needs to be dealt with. Inevitably it is decided that Ganondorf should be executed before he does something outrageous as he did in the Adult timeline. Question: What is the significance of Link closing the Door of Time in your theory? Ben: The reason Zelda gives for closing the Door of Time is to close “the road between times”. Closing the Door of Time, and the road between times, would prevent Link from ever pulling the Master Sword, and consequently, prevent Ganondorf from ever entering the Sacred Realm. Alex: At the end of Ocarina of Time, Link closes the Door of Time in order to seal off the “road between times,” thus blocking the possibility of him being sealed away for seven years as he was in the Adult timeline. Here he is free to live out his childhood to its completion without interruption by his hibernation in the Sacred Realm. It is by closing the Door of Time that the timeline split is realized and the potential for an alternate future comes into play. Simultaneously, leaving the Master Sword in the Pedestal of Time and closing the Door of Time also seals off the Sacred Realm, trapping the unwitting Ganondorf inside. This leaves Ganondorf stuck there and, though he doesn’t know it yet, vulnerable to attack. Thus, it has two purposes: to give him a new future and to give Hyrule a chance to avoid conquest by Ganon. Question: How do you describe Ganondorf’s invasion of Hyrule spoken of in Twilight Princess? Ben: Without Link to open the Door of Time and pull the Master Sword, Ganondorf took a different course of action. His scheming failed, so he instead resorted to a direct attack. This could very well explain why the Temple of Time is left in ruins Twilight Princess. Alex: Essentially that line refers to the actions he takes in the Child portion of Ocarina of Time comes from the desert and launches a covert operation to try to get the Spiritual Stones and the Ocarina of Time, and this eventually escalates to an assault on the royal family in the castle. All of this was done in an effort to seize control of the Triforce, the Sacred Realm, and Hyrule, so it fits the description in Twilight Princess very well. Ben thinks that some of these efforts never took place in the Child timeline, but I believe that everything that happened in the Child events of Ocarina has already happened by the time Link returns to the past. When Link arrives in the past, the Door of Time is already open, and to me this means Ganondorf has already taken the opportunity to get inside it. His efforts are brought to a halt in the Child timeline before he can take over Hyrule, however. Question: How do you think the sages (or whomever acted in their place) were able to “subdue” Ganondorf? Alex: Well, if we look at the Japanese game text, we see that he was “caught off-guard” because of his lack of foresight to comprehend dangers. I see no reference to him being overpowered, only outsmarted. The sages even remark later that they overestimated their abilities to control him. It would seem this carelessness is rewarded with the situation in which they are forced to send him to the Twilight Realm. Near the end of the game, they apologize to Midna for this carelessness; it is because of them that Ganondorf’s evil power was poised to threaten the Twilight World. I think that if the Triforce is involved in such a way as Ben is presenting, the so-called “overestimation” of their abilities is not an overestimation of them at all, but merely a deus ex machina that prevents their efforts from reaching fruition. It is nothing they could have predicted or considered, so their estimation of their abilities would be sound, but inevitably thwarted by outside powers acting rather than those they are acting against, those of Ganondorf himself. anondorf’s crest glowing in the execution scene? Ben: Though Ganondorf, and perhaps even the sages themselves, were unaware that he possessed a Triforce piece, when he was stabbed, it “came to life”. Ocarina of Time‘s scene in which a near-death Ganondorf transforms into Ganon shows that the Triforce has protective and reviving qualities. Sensing its owner was near death, the Triforce of Power resonated and brought a surge of life and energy to Ganondorf, just as it did in Ocarina of Time. Alex: If you watch the ending of Ocarina of Time, you see a similar sort of scenario. Ganondorf, who Link and Zelda had left for dead at the top of the tower, emerges from the rubble and the Triforce of Power gives him a second wind and he transforms into a demonic form. We see the same sort of thing happen with his near-death in the execution scene in Twilight Princess. The sages thought they had killed him, but instead he found new strength. You can even watch him gain more demonic attributes—the whited-out eyes and the devilish fangs. In this section, Ben and Alex will ask each other questions about their interpretation of Ocarina of Time’s endings. They will alternate asking and answering questions, and the person asking the question will get a rebuttal after receiving the answer. Ben: Just prior to Link pulling the Master Sword, Zelda flees Hyrule castle, and does not again reveal herself until all of the Sages have been awakened. So why is Zelda in the castle courtyard in Ocarina of Time‘s child ending? Alex: Where else would Link meet her? Honestly, though, in the Adult timeline, where Zelda is in hiding for seven years, she is hiding from Ganondorf’s pursuits. If Ganondorf disappears into the Sacred Realm in the Child timeline, what stops her from returning to Hyrule Castle? Ben: It just doesn’t seem likely to me that news of Ganondorf’s disappearance would reach the princess, and that she would have time to return to the castle courtyard, all in the time it took Link to walk from the Temple of Time to the courtyard. The cutscene seems to imply there was no delay; Link leaves the Temple of Time and then enters the courtyard. Alex:It would seem you presuppose that Link does not return to a point in the past at which he has already pulled the Master Sword, but instead sometime before, in a fashion that breaks the pattern of the rest of the game. At what point does he return, then, and how do you determine this? Ben:Link returns to a time just before he met the Princess. Evidence pointing to this is the fact that Zelda reacts the same way as the first time she met him, and Link lacks the Goron bracelet, which can only be obtained after meeting Zelda. The reason this “breaks the pattern” of the game is the method of time travel. Throughout the game, adult Link places the Master Sword on its pedestal, and then the scene shifts to him being a child. In the scene, child Link is grasping the Master Sword, releases it, and then control is returned to the player. In the ending though, Link does not put the Master Sword in its pedestal. Instead, Zelda sends him back, and when the scene shifts to Link as a child, he’s standing next to the Master Sword, not grasping it. Symbolic to me of him never having pulled it. Zelda’s different method of time travel for Link brought forth a different result. Alex: I suppose I don’t see why Zelda should send him back to the Temple of Time at all, or even to a point after he leaves the forest, if her intent is for him to have never pulled it. It seems rather arbitrary when looking at her emphasis on laying the Master Sword to rest and closing the Door of Time. These to me are more concrete indicators of the time he’s being sent to: a time after the Master Sword has been disturbed and the Door opened. His position could just as well indicate that he’s not time-traveling with the Master Sword, but laying the sword to rest. We see that same pillar of light that appears when he draws it and opens the Sacred Realm, only this time it seems to be receding. Ben: What reason is there for Zelda’s position [spying through a window in the castle courtyard] and reaction to Link being the exact same as the first time she ever met Link; before he pulled the Master Sword? Alex: Zelda seems to have a penchant for eavesdropping. She already suspects Ganondorf because of her dreams, and yet she is always looking through that window whenever you return to visit her. It would seem her spying has more motives than just keeping an eye on Ganondorf—maybe she enjoys poking her nose into her father’s business? As for her reaction to Link—I believe her reaction was initially to someone getting past the guards, and once she recognized Link she regained her composure. I see no reason why this should not be true in the ending scene. Ben: Zelda doesn’t give the same response to Link if he goes up to her any other time in the game after the first meeting. She only gives the surprised response the first time you meet her, and in the game’s ending. This suggests the events are one and the same. Alex: When does the Triforce split in your theory, what causes this split, and what is your evidence for this cause? Ben: The Triforce splits as soon as Link returns to his original time. It separates because, although time itself split, the goddesses are outside of time. They know who the rightful owners of the Triforce pieces are, and they grant the pieces accordingly. Evidence of this is that Ganondorf was “chosen by the gods to wield the power of the gods”, according to the sages. They don’t say anything of him touching and/or personally acquiring the Triforce, but instead, bring attention to the gods’ influence. Alex: My main problems with this are thus: The goddesses have always previously shown opposition to possession and use of any part of the Triforce by evil forces. We know this of course because they always send heroes to subdue Ganondorf and in the backstory of The Wind Waker they even act directly to stop him from taking over Hyrule since Link has left that timeline. In Twilight Princess they also show antagonism towards those who would try to seize the Triforce; they are responsible for sealing away the Twili’s ancestors. It does not seem compatible with this pattern that they would knowingly grant Ganondorf a piece of the Triforce for any reason. 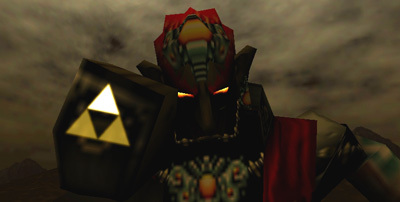 I also find it rather inconsistent with the ending of Ocarina of Time to say that Ganondorf gets the Triforce through a deus ex machina despite Zelda’s supposed efforts to prevent this from happening. If Zelda sent Link back to close the Door of Time and prevent Ganondorf from getting into the Sacred Realm (as you have claimed), why have him obtain the Triforce anyway? It doesn’t make logical sense. Of course, maybe that makes it more plausible—this is the Zelda series we’re talking about after all. Ben: Why does Link lack the Goron bracelet in the child ending? Alex: Why isn’t the scene programmed so that Link cannot have the Hylian Shield? It seems the scene is guilty of sloppy programming either way. Either they must have accidentally taken out the bracelet or they must have forgotten to render the scene so that he has the Deku Shield instead of his most recent equipment. I know we can get into the technicalities of “well, he could have gotten the Hylian Shield before meeting Zelda,” but if they want to alter his equipment to indicate to us that he’s returning to an earlier point in time than they’re used so I should think they would make an effort to do so in every detail. The fact that the Door of Time is open is far more obvious and far more telling than the Goron Bracelet being missing. Ben: The majority of players will have obtained the Hylian Shield after leaving the forest, and before meeting Zelda. Making it impossible for Link to have the Hyilan Shield in the ending would imply that he was sent back to before he ever left the forest. By making it optional, [depending on what you have equipped in the child segment] it leaves the possibility that Link is meeting Zelda after leaving the forest, but before obtaining the Goron bracelet…just as he met her the first time. Seeing as Zelda is the Sage of Time, the state of the Door of Time doesn’t really matter. If she can user her powers as a Sage to send him back in time, and in fact, split time itself, why would she not be able to open the door in the temple dedicated to her line of Sages? Alex: Also, I have some questions about your answer. First, I don’t understand your basis for the Triforce splitting when Link returns to the past. If this was the intent, why did the developers wait until the meeting-scene to show the mark on his hand? Ben: Up until the meeting scene, there was no reason for the mark to be visible. He was not near another person with a Triforce piece, and he was not making use of its reviving or transforming qualities, so there was no reason for it to be visible. It wasn’t until Twilight Princess that the concept of a Triforce piece’s mark being visible without resonating was introduced to the series. Alex: Well, it seems to be that it may have been earlier than that… as far back as the Oracles games. Of course, not all of the official art reflects this, but the manga sure reinforces it. You’re right, though, since Majora’s Mask leaves out the mark entirely. We have some differing presentations over time. But the fact still remains that we cannot determine from the facts that Link gained the Triforce of Courage when he returned to the past, or even that his time travel had anything to do with any of the three obtaining their pieces. Ben: If Link returns at the time you propose, he should have the Ocarina of Time with him. Why then, is Zelda shown to be granting it to him just prior to the game Majora’s Mask in a cutscene? Alex: It’s not rightfully his, and after he closes the Door of Time he has no reason to keep it. He would return it to Zelda as in the Adult ending. Ben: That interpretation creates a paradox though. If Link already gave Zelda the Ocarina in the Adult ending, he shouldn’t be able to give it back to her in the Child ending. The fact that Link gives up the Ocarina in the Adult ending, and Zelda is in possession of it prior to Majora’s Mask indicates that Link was sent back to a time where Zelda possessed the Ocarina. Alex: Also, I have some trouble wrapping my mind around the idea that Ganondorf could be literally chosen. If this was the case, wouldn’t the goddesses have granted him his Triforce anyway, regardless of whether or not he touched it on the Adult timeline? It seems to cheapen Aonuma’s statement that Hyrule was at peace despite the fact that Ganondorf was, according to your theory, still at large and in possession of the Triforce of Power. Ben: He was chosen by the goddesses to wield their power on the Child timeilne because he was the one who owned it on the Adult timeline. The goddesses are outside the effects of time, including a split timeline. Thus, they knew Ganondorf’s actions on the Adult Timeline [as well as the actions of Link and Zelda] and granted all three their respective Triforce pieces on the Child timeline. Alex: This seems kind of far-fetched, as I’ve already stated when I talked about the gods’ interventions in other games. IYou go out of your way to make the point that Link returned to stop Ganondorf from getting into the Sacred Realm and gaining the Triforce, then you again go out of your way to make the point that the goddesses gave the Triforce to him anyway. In fact, the game seems to say little besides that Ganondorf got the Triforce in a surprising turn of events (which he did in Ocarina of Time; this is what a ‘divine prank’ actually means) and that Link returned to make Hyrule peaceful again (not necessarily by stopping Ganondorf from obtaining the Triforce, which clearly doesn’t happen anyway). Ben: How does Ganondorf progress from his sealing in the corrupted Sacred Realm into the custody of the Sages? How do they extract him from his containment, and why is he able to be subdued despite owning a Triforce piece? Ben: I see no major difference between him being sealed via the power of the Master Sword or being “unable to return” via the power of the Master Sword. Your depiction of the Sages’ motives clashes with Eiji Aonuma’s telling of the event. Aonuma states that Link and Zelda “let him be”, but then he did something outrageous, leading to his capture and attempted execution. Aonuma’s description directly contradicts the idea of the Sages capturing him simply because he was “too dangerous to be kept alive”. Alex: Why was Ganondorf “unaware that he possessed his Triforce” and “[unable to] harness its power” when he was clearly aware he possessed it and had full access to it in the Adult timeline? What indications are there of this? Ben: In the Adult timeline, Ganondorf was fully aware that he had touched the Triforce and obtained the Triforce of Power. If he was granted it by the gods, he would not necessarily be aware of this happening. This is made evident in Ocarina of Time, as Link is unaware that he recieved a Triforce piece until Zelda informs him of this. The only implication in the game that Link’s Triforce piece was of any use to him is that Ganondorf states that it helped him. However, this is in the context of Ganondorf in disbelief that a “kid” could do so much damage to his work; a theme Ganondorf brings up often. Context implies this is just Ganondorf’s disbelief that Link could be threat, and thus, his Triforce piece must be to blame. However, Link was able to conquer many of Ganondorf’s minions on the Child side, even before acquiring a Triforce piece. Alex: And yet, elsewhere, all the way back to the release of The Legend of Zelda, we can see that one requires a Triforce piece to challenge one with a Triforce piece. Although your argument here employs the same logic I’ve used against another of your points: that Ganondorf is overconfident and often exaggerates his own strength. If his statements about Link needing the Triforce of Courage are not true, why should the statements that he is chosen by the gods be any more true? Ben: If Ganondorf was trapped in the corrupted Sacred Realm by the Master Sword’s power, why does he view it as “an impressive-looking blade…but nothing more”? Alex: How would Ganondorf have known it was the Master Sword keeping him trapped in the Sacred Realm? Moreover, why would this impact his opinion on its effectiveness as a weapon against his power, especially given his survival during his execution? The fact of the matter is that Ganondorf’s reaction to the Master Sword in Twilight Princess has little bearing on anything beyond his overconfidence. Ben: He was fully aware that the Master Sword had the ability to trap him and repel his powers in Wind Waker, why should the same not be true in Twilight Princess if he was also trapped by the Master Sword in your scenario? In Wind Waker, he took drastic measures [the killing of two Sages] to ensure that the Master Sword would no longer have power over him, because of his previous containment caused by its power. As the Japanese text describes the Master Sword as a “demon-repelling blade”, if Ganondorf had been trapped and repelled by its power prior to Twilight Princess just as he had in Wind Waker, he would have a much different attitude about it. Alex: Why did Ganondorf’s power only activate when he was stabbed in the chest? Ben: One of the qualities of an individual Triforce piece is to protect or revive its injured holder, as has been shown several times in the series. Prior to being stabbed, Ganondorf had never been in a near-death situation, nor had he been near a person possessing a Triforce piece, so there was no reason for his Triforce piece to resonate. Alex: It resonated without either of these conditions in Ocarina of Time. Ben: If Ganondorf obtained his Triforce piece by touching the Triforce, why does the Japanese text use the same exact phrase [chosen by the gods] in describing Ganondorf’s method of aquiring a Triforce piece as it uses to describe how Link and Zelda obtained their pieces in Ocarina of Time? Alex: It was necessary for Ganondorf to touch the Triforce for Link and Zelda to receive the emblems in Ocarina of Time despite the fact that they were chosen. The touching of the Triforce is the mechanic by which the chosen will receive their Triforces. I see no reason why this should not be true in Twilight Princess’s scenario, or why this same principle should not apply to Ganondorf. After all, what use is one’s destiny to save the world if the world does not need to be saved? And how can the world fall under threat without a force actively threatening it? Even though these things are matters of destiny and fate, they still require human action, much like Ganon’s wish to rule the world in A Link to the Past required that he return to the Light World to conquer it. Alex: Varying translations of Aonuma’s interview exist and they suggest somewhat different approaches to the conversation between Link and Zelda. Some suggest that Link and Zelda “let [Ganondorf] be” until he did something outrageous. Others suggest that Link and Zelda decided that they could not “let him be” because he might do something outrageous, leading to his capture and execution. Which of these translations do you use, and how does it relate to your interpretation of the interlude between the two games? Ben: Judging by context, I believe it would make more sense for Aonuma to have said “let him be”. Aonuma later stated that Ganondorf’s attempted execution took place several years after the child events of Ocarina of Time. If Link and Zelda took immediate action to make sure they did not “let him be”, then why did it take several years for the execution to take place? By “letting him be” Link did not pull the Master Sword, and therefore did not grant him access to the Sacred Realm. This is the change in relationship to Ganondorf that Aonuma spoke about. Instead of inadvertantly leading him to the Sacred Realm, they kept him out. This is what caused Ganondorf to take a different course of action. Alex: And yet Aonuma says the child times were peaceful after Link returned to the past. I suppose I don’t see this as compatible with the idea that he was left alone and eventually caused trouble, whereas my view purports that all his trouble has been caused already by the time Link returns to the past. As you can see, both sides of their merits and their problems, as the case often is with theorizing in the world of Zelda. Perhaps a not yet released game will explain the happenings in between Ocarina and Twilight Princess, but it’s just as likely we’ll never be given a definitive answer. After all, that’s what makes it theorizing. For now, it’s up to us to view the facts ourselves and draw our own conclusions on the Debate of Time.